Over the past decade, Amazon has increased its Seattle workforce nine-fold, to 45,000 tech workers. That represents roughly 8% of the city’s total jobs, according to Puget Sound Regional Council. And as the Washington State Department of Revenue outlines, restaurants and food-service businesses have jumped 27% since then. Though Seattle has faced challenges in the wake of the e-commerce giant’s growth, it didn’t deter cities from making their bid for HQ2, with a total of 238 cities submitting proposals for consideration. And as the Journal points out, “city leaders don’t hide their pride that Amazon calls Seattle home.” Following the HQ2 split news, Mayor Jenny Durkan said it was “good news” and called the new locations “branch offices.” This echoes a recent statement by Realogics Sotheby’s International Realty President & CEO Dean Jones, who said the two-city approach has watered down the economic effects on the future locations and will result in “satellite offices” as opposed to another sprawling campus akin to what they’ve built in Seattle. Reporter Mike Rosenberg points out that Amazon is already planning 4 million square feet of additional office space for their Seattle outfit, which equals that of its plans for Long Island City and Crystal City. An Emerald City hiring slowdown is not on the horizon either, as there are currently over 8,000 local job opportunities available at Amazon. Given the tech giant’s strong local ties, it isn’t likely that there will be an impact on housing in our region. 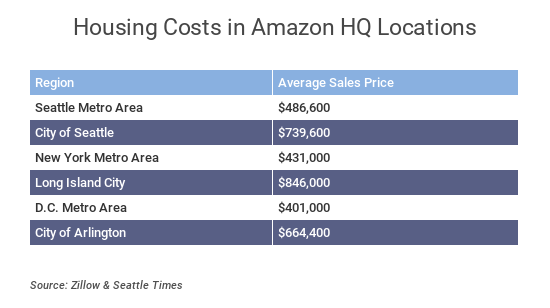 Though it hasn’t’ been made clear “how many current and future employees may be able to choose between Seattle and the two new offices,” Rosenberg writes, “the cost of living will be about the same at all three” locations. Interviews of current Amazon employees revealed an amount of dismay at the chosen cities. “My wife and I were considering moving to an HQ2 city, but now that it’s official that it’s going to be D.C. and NYC, we have backed off those plans,” one tech worker said.